My first trip to Haiti was in January of 2009. I traveled with Christian Flights International as did the Pastor of Faith Lutheran Church, Andrew Harnack, and Dr. Joe King of Faith Lutheran. Our destination was Ranquitte, Haiti, a mountain village in the north central area of Haiti. En route we stayed at Hope House in Port au Prince and left the next morning for Ranquitte. Our pilots were missionaries. The plane ride took us over many mountain villages to the town of Pignon. We landed on a pasture type surface. From Pignon, we were taken by truck to Ranquitte. Most of us rode in the back of the truck. Some rode in the cabin. It was in Ranquitte that we met Johnson Deshommes. He brought his assistant principal to meet Pastor Luckey of Faith Lutheran in Lexington, Ky. They wanted to talk with Pastor about Johnson’s interest in pursuing his education in the United States. Pastor Luckey turned to me and asked me to handle it. This was the very beginning of what was to become a scholarship program for four young men from Rqnquitte. 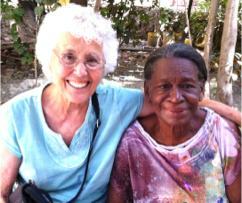 Grace Missions President, Patricia Mundt with Chez Moi Founder Marie Major, during June 2014 Mission Trip. En route home from Ranquitte, we again stayed at Hope House and then back to the United States. In July of 2009, I returned to Haiti as did Dr.Harnack. Sherri Greer and Karen Rider also joined this mission trip. Our destination was again Ranquitte, Haiti. I am not sure it was this trip or the next, but Johnson asked that we consider his twin brother, John Smith, on any plans to study in the United States. Soon thereafter there were two more students – Stevenson and Andronic. Rev. Barry Neese brought Stevenson into the mix of students wanting to study abroad. As I recall, we talked with all of them about the challenges they would face in fulfilling their hopes to study abroad. And, we made it clear, that on our next trip we would want to meet with their parents and we did. In the end, there was a general understanding by all that these young men wanted to study abroad so as to return to Haiti to help their people. This understanding continues and those of us working closely with them continue to remind them of that promise. Whatever one or more might be say about any of this to others does not negate the commitment that these students and their parents made to assuring that one day these four guys would be in Haiti helping their people and their country. On our return trip to Haiti in July/August 2009, we again planned to stay at Hope House. As it turned out, Hope House was over booked so we were taken to Marie’s House of Grace to spend the night. Yes, this is when we met Marie Major, the founder and owner of Grace Orphanage. Simply said, we fell in love with Marie and her girls and we made the commitment to continue to be involved with that program. Trips were made every year thereafter. And each time we stayed with Marie as did our students to be. Back in Kentucky, members of our team visited Eastern Kentucky University (EKU)to see if this was a good place to sponsor our students. Our meetings with faculty at EKU were promising. Contacts were also made with a school in Cedar Rapids, Iowa. The problem that all of the students had to face was getting a Visa from the U.S. Embassy in Port au Prince. Johnson tried 3 times to get a visa and each time he was turned down with no reason given. John Smith has also been turned down 3 times. After doing some grapevine research, Johnson and Stevenson decided to further their education in Argentina. They received a visa for this journey. We made arrangements for their travel and for a Lutheran missionary in Buenos Aires to meet them at the airport. This missionary went to the airport to greet them and to offer assistance, but Johnson and Stevenson were not allowed into the country. They were not even allowed to meet with the missionary. We surmise that the color of their skin and their country of origin were the issues. It became necessary for the guys to look to a university in Port au Prince, which they did and that is where they are today. We asked them to find a lessexpensive university in Port au Prince, but they were convinced that they had picked the best even though it was more expensive. As far as we know, they are in good standing. Dr. Harnack wrote a letter for my signature to the Dean. He also had it translated into French. The letter was emailed. We know she received it as Johnson verified that. She also told him she had responded, but no such correspondence has been received, to date. The guys are finishing their 3rd year at their respective schools. They will have one more year of class work. On completion of the four years of course work, the medical students (Johnson, Stevenson, and Andronic) will do an internship at a hospital in Caphaitian. They will also be encouraged to do a second year which would be called a social year. Social meaning they would volunteer to work in this hospital. Over the next three years, individuals from Indianapolis and Lexington will be working on a plan to help them with earning a residency in a United States hospital. A residency is necessary for any type of specialization. Our hope is to develop a plan whereby a clinic is built in Haiti for our students to practice in. Parties in Indianapolis are especially interested in supplying the clinic with necessary equipment and supplies for the doctors to functions. We envision our students with very specialized degrees spending about 50 percent of their time in the United States and 50 per cent of their time in Haiti – perhaps on a rotating basis. These plans will begin to take shape over the coming months to include counseling with the students about their promise to work in Haiti. John Smith has taken a different path. He started out in agronomy. He then transferred to the school for diplomacy. I am not sure just how he will apply his university learning, but his stated goal is to open a series of schools throughout Haiti and to be financially self-sufficient in 5 years. Why am I writing this in the early hours of Thursday morning? I am doing so to give all Board members a sense of the history of how our involvements in Haiti came about. Yes, the scholarship program and the orphanage have been on separate tracks, but that soon will change. Why? The four original students will graduate and move on and the scholarship program will then serve the young ladies from Chez Moi who are ready to pursue advanced education. When this happens, the scholarship program and the orphanage will not be separate programs. Rather, one will be an extension of the other. It has now been seven years since I took my first journey to Haiti. And while the number seven comes from the Hebrew meaning complete, I do not feel as though my journey has ended. Rather, I am making a new beginning, one in which I may be less physically involved, but one in which my role can be more one of guidance and encouragement. Grace Missions is my heart. I now have more sisters, grandsons, children, reasons to smile and wonderful memories. And what wonderful rewards these are.